Gizo and The Blog: I ate his heart! Last night, while I was hanging around with my friends in our kitchen, a story came up because I ate a heart-shaped biscuit that my friend Sanjay gave. Then he told me this quite interesting story which is from a graphic novel based on the old "Commedia dell'arte" and Harlequin Pantomime and was written by Neil Gaiman. The story takes place on February 14 and because of St. Valentine's Day, it is some kinda romantic story but not the ordinary one. The Harlequin gave his heart to Missy by pinning his heart to Missy's door because he is deeply in love with Missy. Missy found his heart and tries to find whose heart it is. At the same time, Harlequin always follows her and observes every move of Missy. Missy goes to a restaurant and orders something to eat. Then she put Harlequin's heart to her plate and starts to eat his heart. After she finished eating, she can see Harlequin now. This situation have never happened to Harlequin before since women that he gave his heart to never tries to eat his heart. 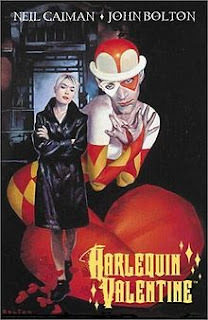 After this, they changed their places and Missy became new Harlequin and in his rest of life, Harlequin remained an ordinary man. This was the overview of the story. I am sure you will find some deep and much more things when you read this book. I don't wanna destroy all of the charm of this comics book about hopeless love.